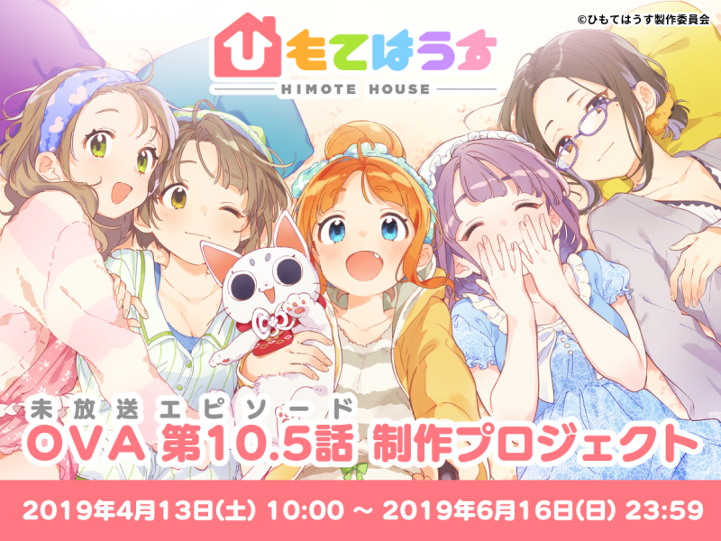 A crowdfunding campaign launched for the release of an unaired episode for Himote House exceeded its initial goal of 3.5 million yen (approximately US$31,000) on Sunday. Numbered as episode 10.5, the episode will come in three parts each titled "Gokuburi Taiji-Kai," (Cockroach Extermination) "Mikoukai PPP," (Unreleased PPP) and "Mikoukai Enishi to Nyarin no Osanpo" (Unreleased Enishi and Nyarin's Walk). The campaign began on April 13 promising the release of the OVA on DVD as its first goal, followed by a Blu-ray release. If the goal exceeds 14 million yen (approximately US$125,000), a "popular studio" will animate the episode with a "high-quality CG" animation, but will instead be hand-drawn by the chosen studio if it reaches 35 million yen (approximately US$313,000). The campaign ends June 17. Himote House is an original comedy anime created by Koutarou Ishidate at studio Bouncy. The anime aired in fall 2018 with a simulcast provided by Crunchyroll. The 12th and final episode was replaced with a special due to production issues. lol, this must be kidding. Japan, as always. I mean the CG even though it's still rough was a step-up compared to Naria Girls still preffered the hand-drawn part tho. And 14 million yen for Orange and 35 million yen for Bones? Best of luck nipponjin I'll be waiting.